Harley takes down the Joker, and Batman begs her not to kill the Clown Prince! Turns out the men in question are merely actors in a Hollywood production about Harley and Ivy, and the girls show up to take control. 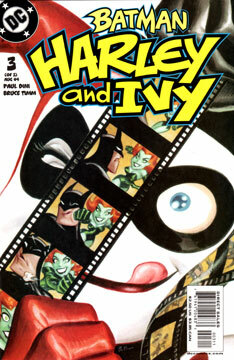 In a flashback, we see Harley and Ivy shortly after they returned to the States from Costa Verde. Harley gets blitzed out on sugar and cartoons while Ivy works on the Zombie Root formula. When they learn of the movie underway about themselves, they head for Hollywood to take control. They crash a meeting of the producers and test the mind-control powers of Ivy’s Zombie Root formula. Harley is ready to burn the whole thing down, but Ivy realizes they could take control as producers and skim off the budget, making millions before they return to Gotham. To keep up appearances, they’ll have to keep the movie shooting. Harley begs to be the director! On the set the next day, Harley is in command and makes a few changes. Actress Harley wears a costume covered in real diamonds, and every shot ends in an explosion of Batman and his allies. This leads to a shortage of leading men, and thus a call for auditions is made. Batman sees it, and suspects Harley and Ivy are back in the country. Back in Hollywood, while Harley ogles the male auditionees, Ivy says they have enough money and should be leaving, but Harley begs to finish the picture. Ivy gives her one more day. Harley decides they should play themselves in the final scene. Harley amps up her presence with an electrified costume of lights, and a Harleycopter. “Batman” is tied to a bomb in mid-air, and the girls bring the Harleycopter in close. Too late, the realize the “actor” is the real Batman, and he pounces on the Harleycopter. Harley’s suit shorts out the copter’s controls, and in no time they crash into the bomb. Batman easily captures his defeated prey, and returns them to Arkham. Despite all odds, Harley’s movie is released to rave reviews and stellar box office. It’s a hit! When Harley tries to persuade Ivy to participate in a remake of “the Poseidon Adventure,” Ivy escapes again —without Harley! What a glorious issue! I would dearly love to see this whole series animated someday. Please, DC, make a special Timmverse DC animated movie of this! Please! Seeing the gal pals in such wacky situations, and yet staying true to character and the world of animated Batman…. It’s a delight, from cover to cover. I would frame and hang in my house any panel from this issue. Timm and Glines at their best. The art is just bursting with energy. And seeing Timm and Dini as producers was a great gag. Yet even more variations on Harley and Ivy in their undies. Ivy as a Hollywood producer. Harley as a director. Hollywood Harley and Ivy. And oh holy cats, I have to got to make me a Harleycopter toy!